Pure & Free Baby Sunscreen Stick Broad Spectrum SPF 60: Provides both UVA and UVB protection with fragrance-free Purescreen. Wet Skin Sunscreen Spray Broad Spectrum SPF 50: Specially formulated with Helioplex technology to be applied to wet skin. Perfect when you're on the beach! Naturals Lip Balm: One of my favorite balms! It makes lips feel soft and smooth thanks to Vitamin E.
Rapid Wrinkle Repair Night Moisturizer: This moisturizer works to fade wrinkles with the inclusion of Accelerated Retinol SA. Makeup Remover Cleansing Towelettes: This pack of 21 cleansing wipes remove even the most stubborn makeup in a flash! And yes, this even means mascara! Body Clear Body Wash in Pink Grapefruit: Salicylic acid and MicroClear technology work to exfoliate, cleanse and rid the body of breakouts. This giveaway has a retail value of $83. Here's how to enter. 4) Follow me on Instagram and like my photo of the Neutrogena basket. This giveaway ends on Monday, December 24 at midnight. One winner will be chosen AT RANDOM on Tuesday, December 25. Maximum of FOUR ENTRIES (one for each way listed above). Multiple entries will be disqualified. Giveaway is open to US residents only. My face and body could really really use this.. I love many of the Neutrogena products - the Naturals line is fantastic; particularly the lip balm! One of the best I've ever used! This is a great variety of products you're giving away - thank you and Merry Christmas! I would love this basket. I've wanted to try the Rapid Wrinkle Lotion. Thanks for the chance! This is a great assortment of products! I love Neutrogena- I've really been wanting to try that lip balm! 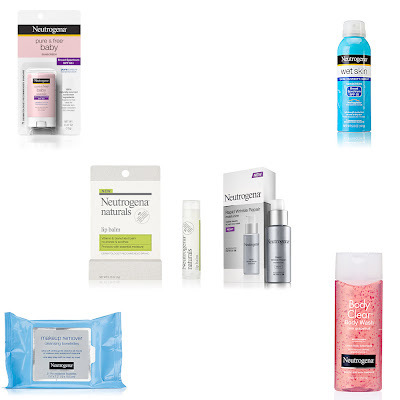 i love all these products, especially the body wash!